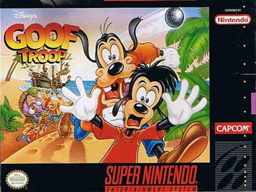 Goof Troop for Super Nintendo allows you to play as Goofy and Max to take on an army of surly swashbucklers as you dodge exploding cannon balls and search dank dungeons on your way to the final showdown with Keelhaul Pete. Along the way, you'll have to dig for treasure and solve puzzles to find the keys that will allow you to enter the pirate's hideout and face Pete. For 1 player.